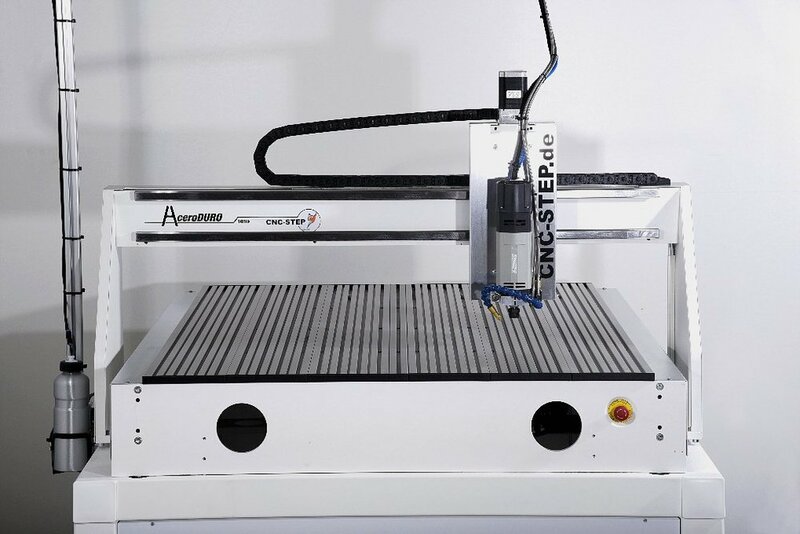 The AceroDURO gantry milling machine is a heavy duty and extremely rigid steel frame CNC model from CNC-STEP. It is a the perfect CNC machine for a small business and for milling hard materials including ferrous metals. Need a lighter CNC instead? A wide range of sizes and accessories available to suit many industrial applications. 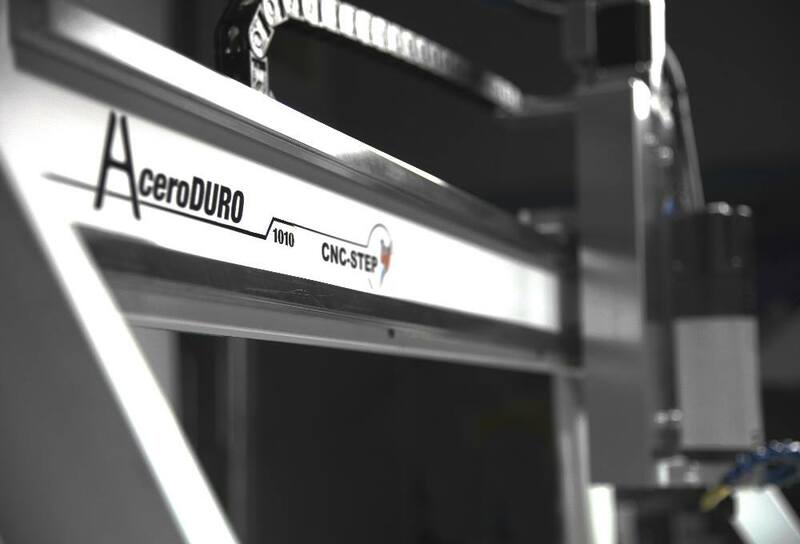 The AceroDURO CNC series was designed with steel and stainless steel in mind. These materials are generally a challenge to mill effectively on small desktop machines. The body of AceroDURO is made from steel and they are all equipped with ball screws and profiled linear guides. This ensures maximum stability when milling hard materials such as ferrous metals and hard stone. The small units are desktop models, while the larger machines come with a steel base/underframe. All machines are offered with an enclosure as well. AceroDURO excels in 2D and 3D applications such as engraving, routing/milling, and cutting with tangential knives, or oscillating tangential knives. Since this is a brand new series, we don’t have videos yet, except one quick preview from the first company to receive the 1000 x 1000 mm size. 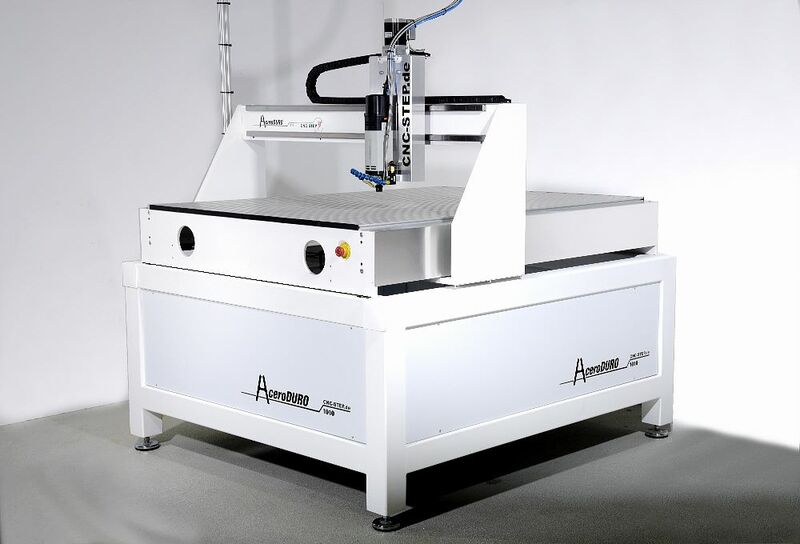 Just like the High-Z range, and the T-Rex range, AceroDURO can be equipped with a vast range of accessories including various HF spindles, rotary axis, tangential cutters, laser scanner, vinyl cutter, diamond drag tool, and much more. With a very high-quality torsion free steel frame, ball screws on all axes, HiWin/THK profiled guide rails, and optimized geometry, the AceroDURO is fast, precise, reliable, and powerful. It is a perfect solution both for small workshops and larger industrial applications alike. In spite of being extremely heavy duty, the desktop models are also cost effective enough for serious hobbyists. Customization for even higher accuracy available with optional ground, preloaded ball screw with <0.005 mm backlash. The machines "AceroDURO DI +" offered as desktop units with powder-coated industrial housing. The machines "AceroDURO I +" offered as floor models with powder-coated industrial housing. Z travel of 180 mm and clearance height between T-slot surface and tip of cutting tools also around 180 mm depending on the tool length. The AceroDuro industrial milling machine was designed to mill stainless steel and steel in 2D and 3D. It is constructed from steel plates and steel profiles with thicknesses of up to 32 mm. The gantry cross section is 25 x 120 mm, with two 20 mm linear guides from HIWIN. This ensures very high torsional rigidity of the Y axis. Also the X and Z axes are extremely stable with the same profiled linear guides. Naturally, any softer materials can be processed, such as wood, plastic, soft metals, paper, fabric, and much more. All axes have powerful high-end brushless motors - stepper motors, closed loop steppers, and servo motors available. The ball screw spindles of the standard system are designed for an accuracy of 0.03mm / 300mm. On request, higher accuracy classes are offered with spindle backlash <0.005 mm. The repeatability of the CNC machine then comes down to 0.005 - 0.01 mm. The AceroDURO uses our very high-performance control sotftware KineticNC. This industrial program offers trouble free operation via Ethernet connection. In 3D operation (3-axis synchronous operation) traverse speeds reach 8 meters / minute. That's already a respectable 130 mm per second . In 2D operation, the milling machine achieves even higher traverse speeds. 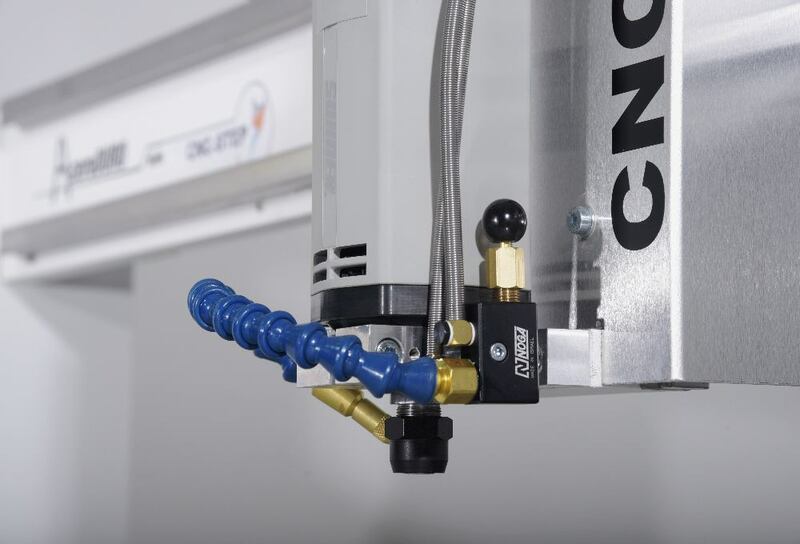 The AceroDuro can be supplied with a 6-station tool change magazine and a 2.2 kW HSK E25 water cooled ATC spindle, including a tool length sensor and spray mist cooling. Chip collection, machine lights, and a special enclosure to be introduced in 2019 for a special PLUS version of the AceroDURO.